Bose has brought the preset convenience of its Wi-Fi SoundTouch line of wireless speakers to a new little mono brother, the 8.3-inch tall SoundTouch 10 ($199.95 on bose.com or $199.00 on Amazon). Bose's big SoundTouch selling point in comparison to the growing boom in multiroom wireless speaker systems, ignited by Sonos, is its presets. Atop each SoundTouch speaker are six numbered buttons. Each numbered button represents a preset – playlists, streaming services, a specific song, whatever you want – that you customize in the Bose SoundTouch Control Android or iOS app. Simply hit one of these six buttons on your SoundTouch speaker and your music begins to play, as long as your music source device is within Wi-Fi range of a SoundTouch speaker. Your phone can be another room asleep and charging – no problem. 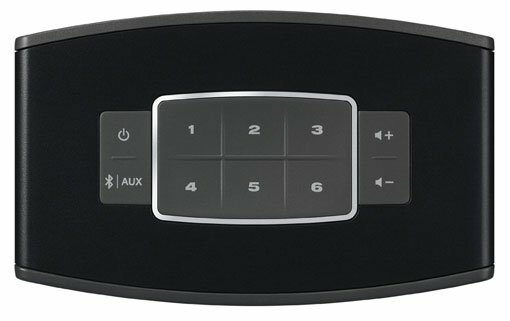 For added convenience, each speaker also includes a stick-of-gum-sized remote, which also includes the six preset buttons. In addition to its look-ma-no-phone operation, you can create multiroom sound, using the SoundTouch app to send separate simultaneous streams of sound to different rooms. This means you can mix-and-match varying SoundTouch speakers throughout your abode. The SoundTouch 10 itself is an AC-powered speaker (i.e. 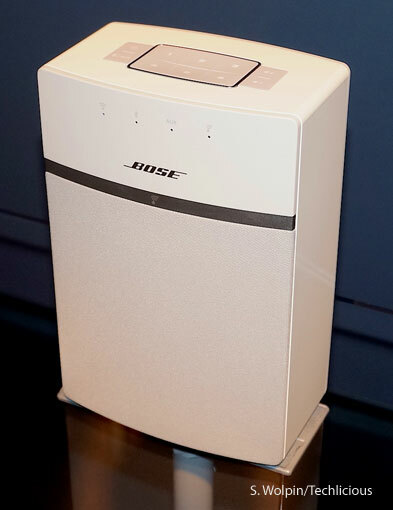 no battery) with a newly designed 2.5-inch transducer with more "excursion" – the way a speaker pumps to produce solid sound – than any other speaker of its size that Bose was able to find. The SoundTouch 10 is available in either white or gray/silver. Bluetooth pairing is traditional – there's no NFC tap-to-pair. The SoundTouch 10 also lacks aptX that adds sound enhancement for Android phones connecting via Bluetooth. Bose added Bluetooth to the previously Wi-Fi-only SoundTouch 20 ($349.95 on bose.com or $349.00 on Amazon) and SoundTouch 30 ($499.95 on bose.com or $499.00 on Amazon), each now in version III, as well as the company's SoundTouch soundbars and home theater speakers. Bose also has eliminated potential conflict between two competing Spotify apps. Embedded within the Bose SoundTouch Control app are access to Spotify, Pandora, iHeartRadio and Deezer. But you likely also have a dedicated Spotify app on your phone. Which app does what when? The new "ReadySet with Spotify" feature erases this conflict. Switching from the SoundTouch app to the Spotify app is seamless – one app will pick up wherever you left off from the other. For instance, search for any song, album, artist or playlist within the SoundTouch Controller app, or control the SoundTouch systems from the Spotify app. Bose claims it's the first wireless speaker maker to offer this Spotify app integration. "ReadySet with Spotify" will be available early next year, and will operate with any SoundTouch speaker. To access this enhanced integration you'll have to be a paying Spotify subscriber.